Dubai is not only renowned as the most happening city for its remarkable attractions, but, also for its grandest and outlandish hotels. Tourists from across the globe witness enormous luxury hotels in Dubai. The luxurious hotels definitely offer its guests exceptional pampering, top-notch facilities, quality food and high-class comfortable rooms. Not only in specific parts of the year, but nearly every month and every day, tourists from all over the world visit Dubai. The majority seeks to stay at one of the most amazing and luxury hotels in Dubai that offer a complete lifestyle package. Burj Al Arab is an ideal representation of all, which is considered highly magnificent about Dubai. It is one of the preferred luxurious hotels that has also, attained the title of most expensive hotel in Dubai. The hotel is approximately charging $1983 per night. After the sunset in Dubai, the hotel’s exterior displays a light show, which is seems like dancing across the sail-shaped building. Burj Al Arab is known for its splendid 2-floor Royal Suite. This suite features a staircase, which is made up of marble and gold, 4-poster canopy bed with a rotating bottom. The breathtaking views of Jumeirah from Burj Al Arab are another add on! Every floor of the hotel has its dedicated butlers’ team and a reception desk, in order to facilitate the guests on their respective floors. This service makes it easy for guests to make reservations at the on-site or outside restaurants, plan a tour of the town and much more. Those who have witnessed the serene ambience and cozy large villas at Jumeirah Dar Al Masyaf, will never deny their extraordinary service and will agree that it is impossible to beat the hotel. Every room has a private pool and mini-complex’s private restaurants. Dar Al Masyaf, has been built and designed with an inspiration from conventional courtyard summer houses. Dar Al Masyaf is listed among the luxury hotels in Dubai for its beautiful landscaped gardens through which flows a water stream. Rooms and suites are very much spacious, highly fascinating and luxurious. The hotel charges approximately $442 per night for a room. Guests are provided easy access to a number of facilities like Talise Spa, Restaurants, Gymnasium and Jumeirah Souk Madinat. One of the most luxurious hotels in Dubai, The Ritz-Carlton is built within the Dubai International Financial Centre (DIFC). DIFC is famous for its super awesome night life, business, modern restaurants and art galleries. Ritz-Carlton provides a direct path to reach the center of DIFC. Bar terrace at the hotel offers a pleasant view of the sunset, which is a beauty in itself. The rooms are commendable and classy, especially the Royal Suite that provides an amazing view of the DIF Gate. There is an outdoor rooftop with a pool at the hotel from where one can view a few of the Dubai’s renowned landmarks. Also, guests can enjoy drinks and Shisha at a place surrounded by palm trees and a peaceful landscape. At Dubai Spa, guests are offered numerous holistic treatments along with indoor and outdoor pools. It’s Ambassador Suite starts from as high as $900 per night. Raffles Dubai is likely to be listed among one of the iconic buildings. It can be reached within 10 minutes from the Dubai International Airport. Inspired by the Egyptian theme, a big pyramid represents the Raffles Dubai. The top of the pyramid is known as one of the most elite clubs of Dubai. It’s Landmark Suite is the most expensive room, which is approximately charged $925 per night. Raffles Dubai is connected Wafi Mall, all offering top-class lifestyle with a dedicated Kids Zone. Dubai Mall and Downtown Burj Khalifa can be reached shortly from the hotel. Its rooms and suites are considered the largest in Dubai, which are meant to enhance your stay with amazing Dubai skyline views, remarkable hospitality, matchless comfort zone and style. Atlantis, The Palm is unique in itself! It has been built on a man-made island, named The Palm. It seems like a whole city has been developed inside. Its top-notch interior and exterior has captured the attention of many, all over the world. Furthermore, the hotel features commendable entertainment and marine attractions, which everyone can enjoy. Restaurants within Atlantis offer a variety of scrumptious food, which has been awarded for satisfying the taste-buds of guests at large. Each and every room in Atlantis offers amazing views like from some rooms, guests can enjoy across the beach view, azure waters of the Arabian Sea and some can enjoy extremely impressive Dubai skyline. The hotel’s signature suites start from $7080 per night. Located near to the Dubai Marina Beach, Grosvenor House is also among the center of attractions in Dubai. Being categorized among the most expensive hotels in Dubai, its infrastructure truly redefines its standing. It has two iconic shining towers of 45 storeys and features 749 big ultra-modern rooms, suites as well as apartments. The hotel offers signature Luxury Collection furniture along with an amazing view of Marina. The Royal Suites at Grosvenor House starts from approximately $3335. The best of elegance has been enclosed within Grosvenor House, which is beyond the expectations. The hotel has so much to offer its guests like classy restaurants, Buddha Bar, Spa, Business facilities and much more to enhance the experience. From the Grosvenor House, beach, golf club, malls, Dubai Internet city, Media City and other attractions are just at a drive of few minutes. Four Points by Sheraton, located on the Sheikh Zayed Road Dubai, is another renowned luxurious hotel in Dubai. It is just at a drive of 5 minutes away from Four Points. The hotel offers avant-garde, spacious and cozy rooms, suites and apartments along with amazing views, which are also equipped with state-of-the-art facilities. Four Points have special Business rooms that are more spacious. The hotel offers a separate Z Business Lounge to business travelers, a place where they can perfectly spend their day in peace, while working. Business travelers are offered exceptional services from Four Points like all-day snacks, complimentary breakfast and drop at airport and Internet access. Moreover, all the guests at the hotel can enjoy food at international restaurants and exotic 360 degree view of Dubai at Level 43. The hotel’s 3-bedroom hotel apartment starts from $504. Movenpick Hotel Ibn Battuta Gate Dubai is inspired by ancient travels. The infrastructure is highly impressive in out-class Arabian style. One’s stay at Movenpick Hotel is undoubtedly memorable and an opportunity to explore lively Dubai. The hotel is at walking distance from Ibn Battuta Shopping Mall and Dubai Metro, through which one can easily visit the city’s best attractions. Dubai Marina, Jebel Ali Free Zone and the Palm Jumeirah are situated nearby. Movenpick Hotel features 396 rooms and suites, having a splendid interior. Also, guests can enjoy a variety of savor scrumptious cuisine from Arabia, China, India and Mediterranean in its different 8 restaurants, lounges and cafes. Access to the beach is complimentary and for children as well, the hotel offers many fun-filled activities at the Camel Kids Club. Its most expensive room is a two bedroom hotel apartment, which approximately starts from $1280 per night. The Address Dubai Marina is among the top luxury hotels in Dubai. The hotel offers delicious food in its avant-garde restaurants, spacious lounge for business meetings and enormous facilities for fun activities. The Address Dubai Marina is renowned for its exceptional services and hospitality. A serene view awaits its guests accompanied by crystal clear water, along with avant-garde architecture and ultra-modern yachts moor, beside the trendsetting restaurant. The Address Dubai Marina pampers its guests in the spa facilities, providing them complete relaxation. It is a complete definition of today’s modern style and comfort, serving guests with the best of their efforts. Average per room rate at The Address Dubai Marina is $655 per night. The list of the most expensive hotels in Dubai encompasses The Palace Downtown Dubai. Located in the center of Downtown Dubai, the Palace is an outclass city resort. The hotel is a complete blend of classic theme and Arabian tradition, offering exceptional class guest rooms and suites. Guests at the Palace can choose and enjoy international food and beverages. The Palace Downtown Dubai has set its own standards with its intricate design and best location. Its ground-breaking architecture and dedicated quality services, makes it stand apart. Its Palace One-Bedroom Suite with Fountain View start from average $1008 per night. 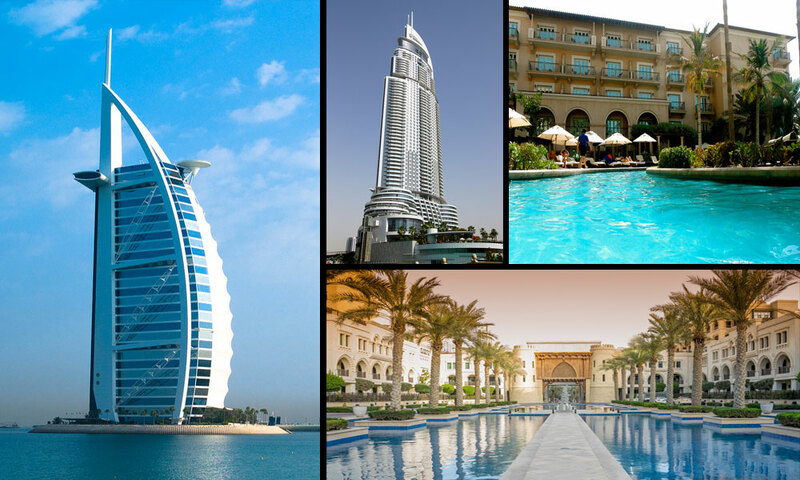 These are the recommended luxury hotels in Dubai, and I am sure you will be able to pick your favorite most expensive hotel in Dubai from the list. If you want to recommend an expensive Dubai hotel, please do so by adding comments below.